You may be looking for John Madden and not even know it! 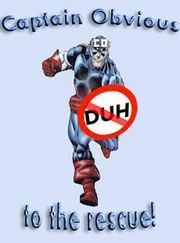 Captain Obvious is a superhero — one of the people who fight bad guys, supervillains, and assorted evil-doers. The prefix "Captain", however, is purely symbolic. Although the "Obvious" part of Captain Obvious's name is certainly true, Captain Obvious does not hold the rank of Captain in the Army, Navy, Air Force, Coast Guard, Marines, the National Oceanic and Atmospheric Administration Commissioned Corps, the United States Public Health Service Commissioned Corps, the Salvation Army or any Police or Fire Department. Nor is he licensed to fly commercial or cargo aircraft or pilot fishing boats or cargo vessels, meaning that in a situation where he would have to pilot one of these vehicles and is asked by a duly authorized official to prove that he had the legal right to do so, he would not be able to. Captain Obvious's symbol is a large "O". This is the circular image on his chest, identical to the letter used elsewhere; however, its use in such instances does not necessarily pertain to Captain Obvious. The "O" stands for "Obvious", rather than "Oklahoma", "Oregon", "Osama bin Laden", "Orange", "Ombudsman", "Obama", "Oblivious", "Ohio" or any of the other six words that begin with an "O". He sometimes carries a large shield with him, though this is primarily to stop his own team mates from beating the living daylights out of him. His main rival is the dastardly Professor Subtle, against whom he battles in many comic book and television episodes, but Professor Subtle never fails to reappear in subsequent episodes. This could be because Captain Obvious has failed to apprehend or destroy Professor Subtle in any way, or because, as Captain Obvious has pointed out on several occasions, "It's all retcon's fault!". Note that this is not one of Captain Obvious's statements. He readily addresses that fact that he is rarely "to the rescue". He first rose through the ranks of the Professor Xavier's School for Gifted Youngsters to join the X-Men. His actual superpowers are known by very few. Some speculate that it has something to do with levitation, super intelligence, or raising the dead. Whatever it was, most people forget that he has any superpowers, and eventually the name 'Captain Obvious' caught on. 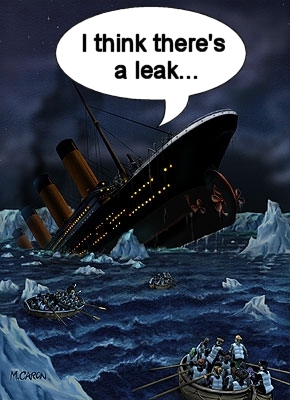 Captain Obvious on the Titanic. He was first brought into the X-Men for his intelligence and vocalness, which quickly drove the group mad. He managed to demonstrate a moderate degree of usefulness when he was able to annoy and distract an evil-doer (a time-traveling evil mutant clone of the Silver Surfer) with his obvious statements, which gave the X-Men time to infiltrate the villain's lair. However, he earned few points with them for this performance because the X-Men were only infiltrating to rescue Captain Obvious. He was later expelled from the X-Men due to his numerous bouts of obviousness. The final straw came when Magneto broke into the X-Men's headquarters after Captain Obvious hid the key under a doormat, making off with Professor X's CD collection and the team's X-box. His expulsion may also have been related to the non-professional nature of his relationship with his sidekick, Readily Apparent Boy. Although group members did not disapprove of such relationships (the J.L.A. readily tolerated a clandestine relationship between a certain bat-themed hero and his sidekick), the indiscreet nature of the relationship - including flirting in public and spats in crowded restaurants - drew unwanted attention to the Justice League. "I mean, it really wouldn't have been a problem," said Superman in an interview, "If they didn't have to make it just so freakin'... ya know... obvious." 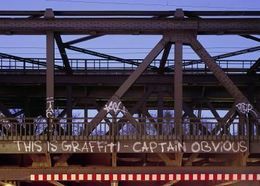 Captain Obvious may also be an alias of Banksy. 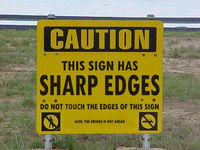 Though Captain Obvious vehemently denies this (over and over), some suggest that Captain Obvious and Mr. Obvious are the same person. Those people note that, whenever Captain Obvious leaps into action, it's always right after Mr. Obvious conspicuously leaves, loudly saying, "I'm leaving now, but not to do anything interesting! I'm certainly not switching to my superhero identity, which of course, I do not have, as most people do not!" These conspiracy nuts, however, are always disproved instantly. The fact that Captain Obvious has stated on many occasions that he is probably not Mr. Obvious (nudge nudge wink wink), or that it would simply be way too obvious, are commonly accepted as proof. 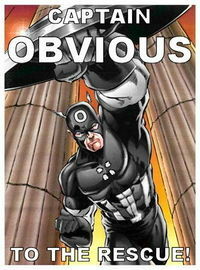 Captain Obvious is also not to be confused with Captain Oblivious. That's his twin brother. 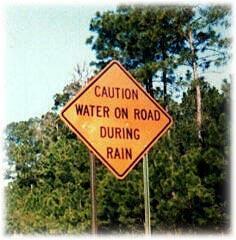 One of the many road signs made by Captain Obvious. Captain Obvious strikes again, this time letting a cat know that it is a cat. His obviousness sometimes causes him to lose focus. This inability of Captain Obvious to stick with any particular group has also hurt his cultural standing. An entire thirty minutes were cut from the first X-Men film to eliminate his role, due to the sheer 'predictability' of the character. He appeared once on The O'Reilly Factor in a historic appearance that lasted all of ten seconds when he blurted out that "Wait a minute, this show isn't fair and balanced at all." His comic book line sold out its first three issues, but sales quickly plummeted due to what readers complained was 'predictable writing.' These days he fills in minor roles, usually uttering phrases such as "That asteroid is heading straight toward us!" or "If we don't defuse this hydrogen bomb, the whole city will be destroyed!" His 900 page autobiography was also panned. In the book, titled 'This is a book about me, Captain Obvious', he admits what was already believed by many to be his greatest weakness. His autobiography had the following chapters. My Birth. How Two Opposite Gender Adults Make Me. Growing Up. The Tough Obstacles I Endured Like Learning to Walk and Eat. Puberty, A Time of Change In My Life. That Time I Wrote an Autobiography, and the Kind of Stuff That Went Into It. This is The Last Chapter. Captain Obvious has also tried predicting the future. Here are a few examples of his predictions. "Nah, duh." Captain Obvious is always good at pointing out the obvious. This article was one of the Top 10 articles of 2006 (ish). This page was last edited on 11 September 2016, at 16:12.